So, it finally stopped raining and I was able to spend a few enjoyable hours in the grounds of Hampton Court Palace, soaking up the sights, the smells and the mud underfoot. 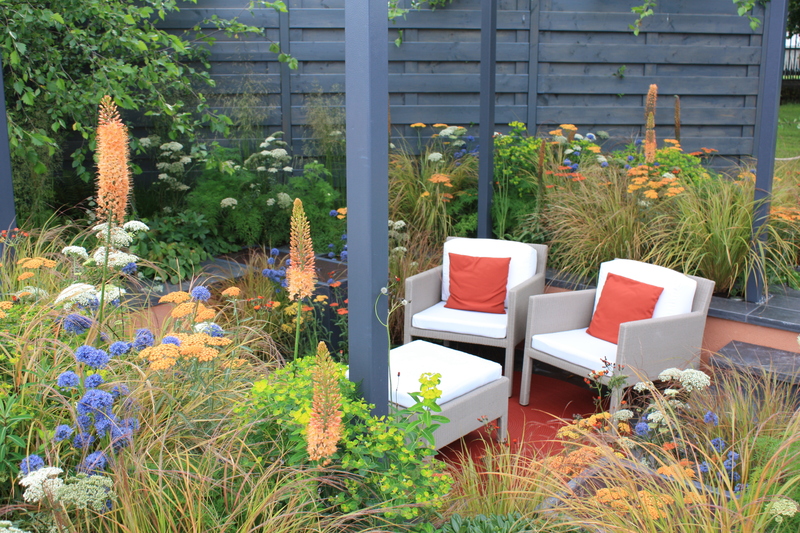 Hampton Court flower show is our second biggest show after Chelsea, but Chelsea it is not. Although it’s a more spacious event, the gardens are generally on a smaller budget, with fewer big name designers. The show is also much more commercial – which I think is a blessing and a curse. It’s certainly great to have the opportunity to buy a few choice specimens. The range of rare and unusual plants on sale is almost overwhelming, but the growers and nurserymen are always so helpful, knowledgeable and happy to see their well tended plants go to new homes. 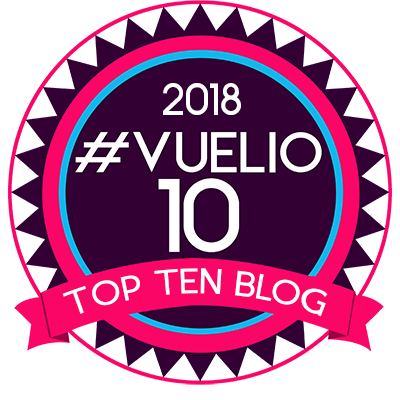 At the same time it’s irritating (and sometimes painful) being cut up constantly by dithering old dears with wheelie crates full of plants – the sound of them rumbling along the metal walkways destroying any remnants of tranquility. In places the number of retail and trade stands dominates the show and the plants take a back seat. Still, I realise it’s a bit miserable of me to complain, and I soon succumbed to the same temptation to indulge. I even departed with my own wheelie crate. Well if you can’t beat ’em, join ’em! 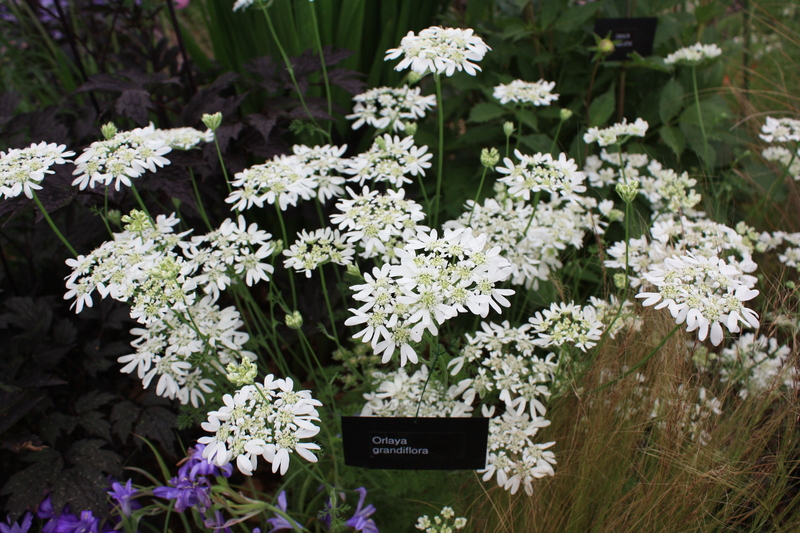 Orlaya grandiflora – “white laceflower” a pretty, hardy annual which resembles a lace-cap hydrangea. I bought some seeds from Avon Bulbs, my favourite bulb supplier. Digitalis parviflora “Milk Chocolate” – A biennial foxglove species originating from Spain and Portugal. It produces thin flower spikes closely covered in small chocolate brown trumpets. Not quite sure about this one personally. I thought it was rather ugly. However, foxgloves of all kinds seemed to be very much in vogue this year. Trifolium ochroleucon – Looking rather like a giant cream-coloured clover, this is a hardy perennial, beloved by bees, butterflies and RHS members. Allium caeruleum azureum – an incredibly vivid blue allium – used everywhere in combination with sulphur yellows and oranges (see below). 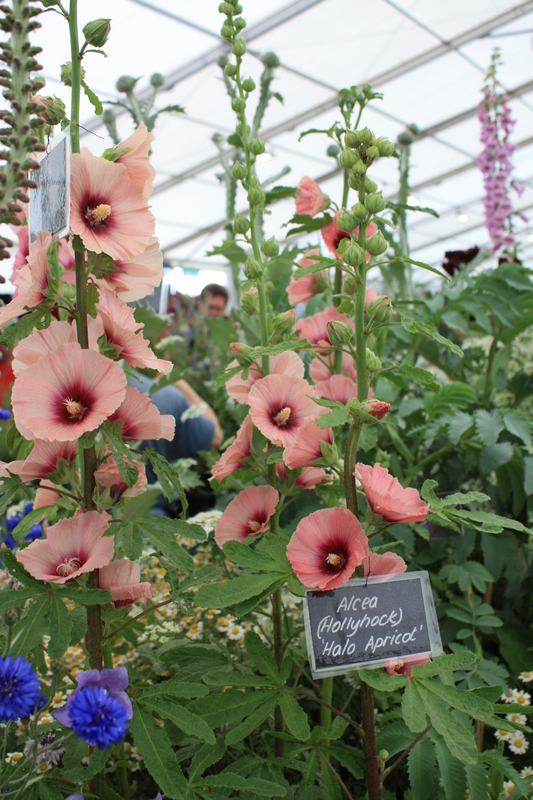 Alcea “Halo Apricot” – shown below on The Botanic Nursery’s stand. Pretty and old-fashioned. Begonia luxurians – a giant begonia from Brazil, with leaves like a Schefflera or a palm. Each leaf has 10-15 leaflets radiating out from a reddish centre. Totally tropical. I would have succumbed had I not run out of cash by this stage. Cosmos peucedanifolius – a South African perennial cosmos, with pure pink flowers. Needs a bit of frost protection, like a dahlia. I bought three to create a decent clump. Oh dear. 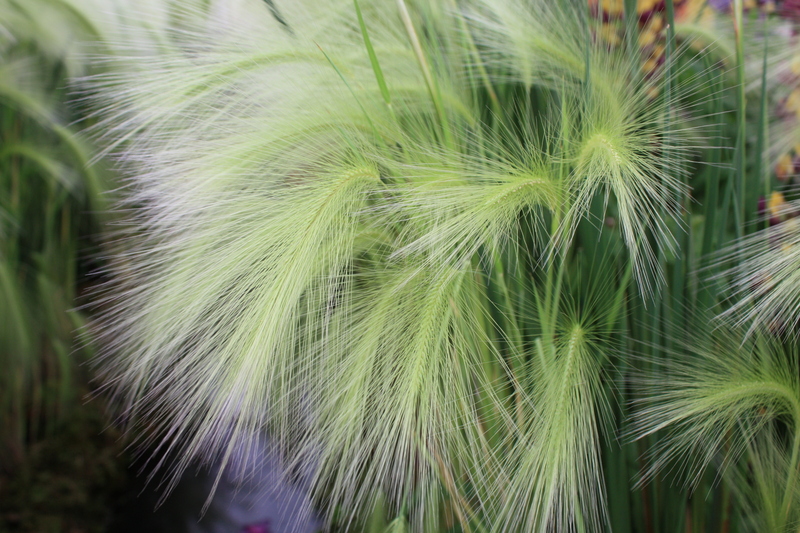 Hordeum jubatum – squirrel tail grass. An annual or short lived perennial with fine, feathery seed heads. This was a big hit with visitors, its little “tails” sticking out of many a carrier bag…and wheelie crate. Passiflora “Sue Beardshaw” – I adore passion flowers. They are so impossibly complex, yet perfect. This new variety was a lovely shell pink, with reddish buds, and was spotted in the plant heritage tent. 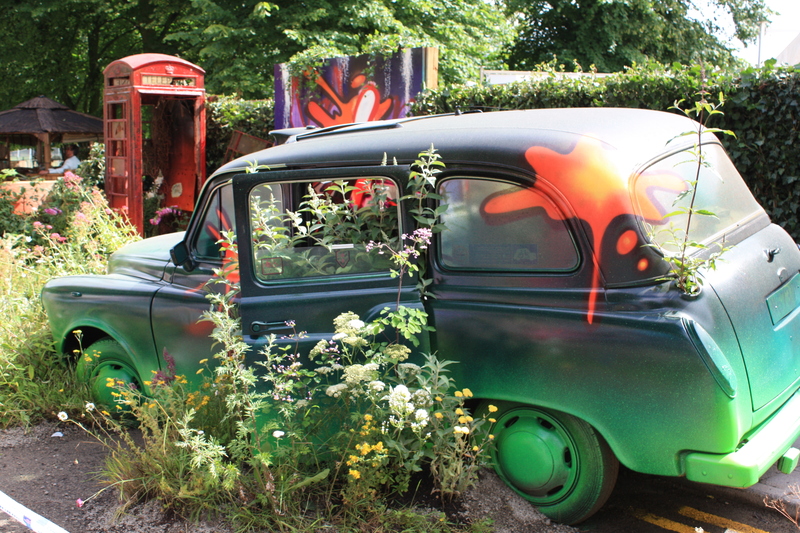 More on the show gardens and floral marquee coming soon! I’m glad I found your site from the Taste of Morning”! Reblogged this on Royal Horticultural Society of Queensland.